Preheat the oven to 350°F. Line two 16 3/4x12-inch jelly roll pans with parchment paper. Spray with cooking spray. Prepare each cake as directed on the box. 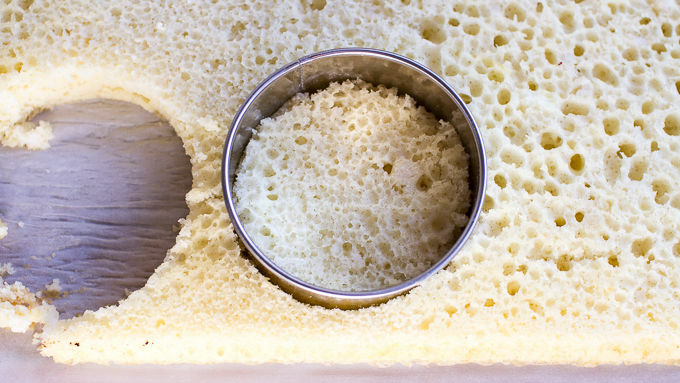 Pour each batter onto the prepared jellyroll pans. Bake for 20-25 minutes or until toothpick inserted into the center comes out clean. Lay 2 sheets of parchment on a clean counter. Invert the sheet cakes onto the pieces of parchment. Allow the cakes to cool. Using a 3-inch round cookie cuter, cut out 12 circles on each sheet cake (12 white circles and 12 red circles). Place 6 of the white cake circles on six different serving plates. Frost the top of each circle with whipped cream and then top with strawberries. 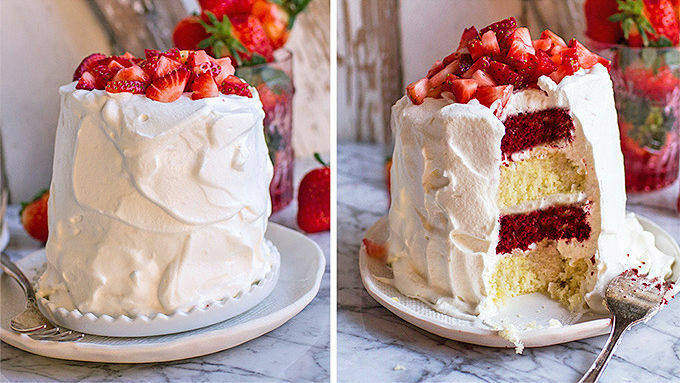 Place a red cake layer on top and frost with whipped cream. Add the strawberries. Repeat with the remaining cake layers until you have 6 (4 layer) cakes. Once you have 4 layers to each cake, frost the outsides of the cakes with whipped cream. 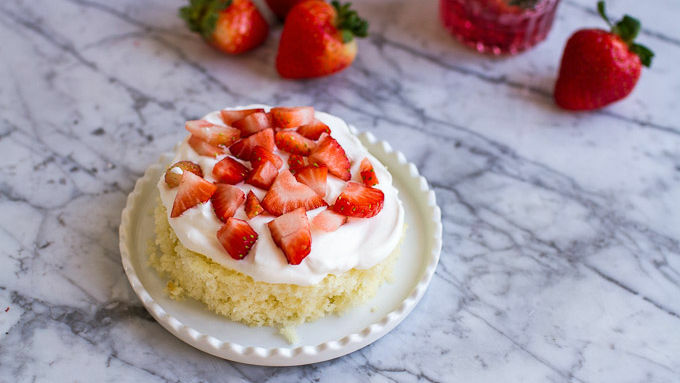 Top with chopped strawberries. Place cakes in the fridge for at least an hour (or up to one day) until you are ready to serve. These can also be made into one four-layer cake. These aren't difficult to make, just difficult to keep around! So you know how it’s February? And it’s freezing cold and all we want is some warmth this Valentine’s Day? 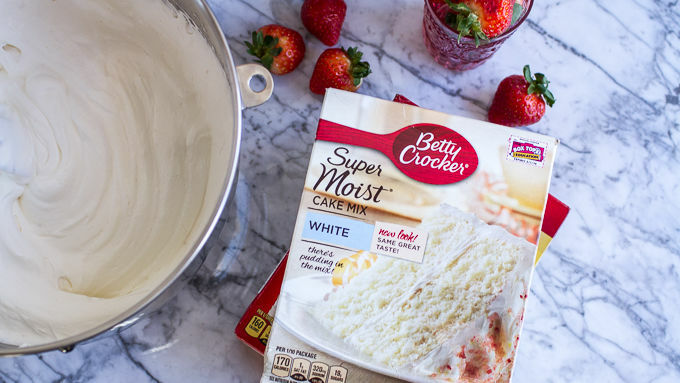 Well, I can’t give you warmth (unless you live in a warm state… then I'm very jealous of you), but I can give you a little burst of fresh summer flavors mixed with the perfect Valentine’s Day dessert. 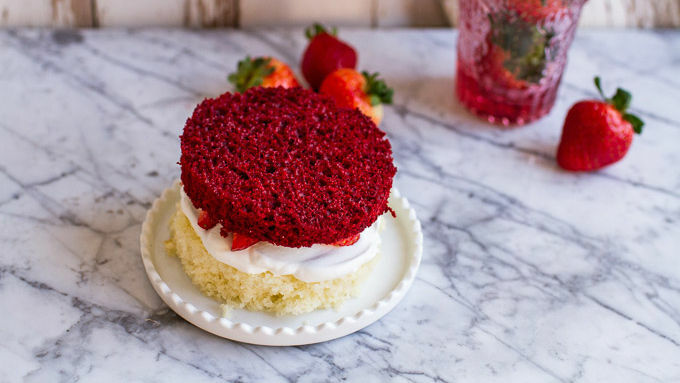 We saw this Red Velvet Strawberry Shortcake over at I Am Baker and thought it made the perfect mix of winter and summer. 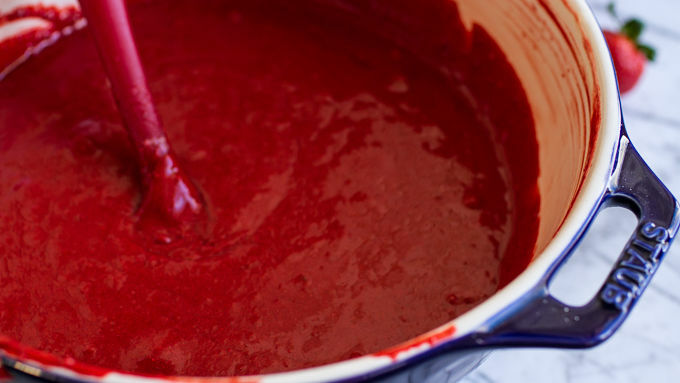 You have the classic flavors of red velvet mixed with some fresh strawberries. Add a little white cake and a little whipped cream too. What a pretty layered combo! But in Tablespoon style, we wanted to shake it up a bit and make this pretty cake teeny tiny. So we've got 6 mini cakes! Whoever you make these for, they will be in love with them.